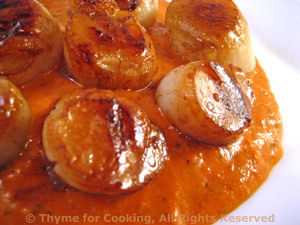 Seared Scallops with Tomato Cream, Thyme for Cooking healthy gourmet. The scallops are finished with a light, tomato cream, which nicely balances their richness. Scallops release a lot of liquid when cooked, so be careful not to crowd. Roughly chop shallots, mince garlic. Heat 2 tsp oil in large nonstick skillet over medium heat. Add 1/2 tsp paprika, shallots, garlic and sauté until shallots are tender. Remove and put into a blender along with tomato sauce, wine and basil. Purée until smooth. Heat remaining 1 tsp oil and 1/2 tsp paprika in the same skillet over medium high heat. Add scallops and quickly sauté, turning once, until opaque. Remove scallops and keep warm. Drain any liquid from skillet. Add tomato sauce to skillet and heat through. Stir in yogurt and spoon onto a small platter. Top with scallops and serve.